Die Sabbati, 23° Junii 1832. Sir T. Boughev's Estate Bill. Zemindar of Nozeed Bill, Account respecting, delivered. Ds. Melbourne, Unus Primariorum Secretariorum. March. Lansdowne, Præses. The Lord Chancellor acquainted the House, "That His Majesty had been pleased to issue a Commission to several Lords therein named, for declaring His Royal Assent to several Acts agreed upon by both Houses of Parliament." Commons, "The Lords Commissioners desire their immediate Attendance in this House, to hear the Commission read." "His Majesty, not thinking fit to be personally present here at this Time, has been pleased to cause a Commission to be issued under the Great Seal, and thereby given His Royal Assent to divers Acts which have been agreed upon by both Houses of Parliament, the Titles whereof are particularly mentioned; and by the said Commission hath commanded us to declare and notify His Royal Assent to the said several Acts, in the Presence of you the Lords and Commons assembled for that Purpose: Which Commission you will now hear read." "William the Fourth, by the Grace of God, of the United Kingdom of Great Britain and Ireland, King, Defender of the Faith; To Our right trusty and right well-beloved the Lords Spiritual and Temporal, and to Our trusty and well-beloved the Knights, Citizens and Burgesses, and the Commissioners for Shires and Burghs of the House of Commons, in this present Parliament assembled, Greeting: Whereas in Our said Parliament divers and sundry Acts have been agreed and accorded on by you Our loving Subjects, the Lords Spiritual and Temporal, and the Commons, in this Our present Parliament assembled, and endorsed by you as hath been accustomed, the Titles and Names of which Acts hereafter do particularly ensue; (that is to say,) "An Act to apply the Sum of Four Millions out of the Consolidated Fund to the Service of the Year One thousand eight hundred and thirty-two:" "An Act for consolidating and amending the Laws relating to the Payment of Army Prize Money:" "An Act to continue and extend the Provisions of an Act passed in the Fifty-ninth Year of His Majesty King George the Third, for giving additional Facilities in Applications to Courts of Equity regarding the Management of Estates or Funds belonging to Charities; and for making certain Provisions respecting Estates or Funds belonging to Charities:" "An Act to suspend, until the End of the next Session of Parliament, the making of Lists and the Ballots and Eurolments for the Militia of the United Kingdom:" "An Act to extend the Provisions of an Act of the First Year of the Reign of His present Majesty, for altering and amending the Law regarding Commitments by Courts of Equity for Contempts, and the taking Bills pro Confesso; and to explain certain Parts thereof:" "An Act for making Provision for the Dispatch of the Business now done by the Court of Exchequer in Scotland:" "An Act to regulate the Practice and the Fees in the Vice Admiralty Courts Abroad, and to obviate Doubts as to their Jurisdiction:" "An Act to extend the Provisions of an Act of the Fifty-seventh Year of His Majesty King George the Third, for regulating the Offices of Clerks of the Signet and Privy Seal:" "An Act to enable His Majesty, His Heirs and Successors, to appoint a Trustee of the British Museum:" "An Act to promote the Improvement of a District of Mountain Land in the Counties of Limerick, Cork and Kerry, in Ireland, by making new Roads through the same; and to encourage the Employment of the poor Inhabitants thereof:" "An Act to regulate the Office of Clerk of the Crown in the Court of King's Bench in Ireland:" "An Act to extend the Jurisdiction of the Commissioners acting in the Execution of Three Acts for paving and regulating the Regent's Park, and several Streets and Places in Westminster, to certain other Streets and Places in Westminster; and for other Purposes:" "An Act for holding the Assizes for the County of Norfolk, and for the City of Norwich and County of the same City, Twice in every Year at Norwich:" "An Act for more easily providing Compensation for the Damage and Injury committed within the City of Bristol and County of the same City during the late Riots and Disturbances therein:" "An Act for repairing, lighting and watching the District of the United Parishes of Saint James and Saint Paul, in the County of Gloucester; and for the Care of the Poor thereof:" "An Act for improving and regulating the Township of Chorlton-upon-Medlock, in the County of Lancaster:" "An Act for paving, lighting, watching, cleansing and improving the Town and Port of Hastings, in the County of Sussex, and for establishing and regulating Markets therein, and supplying the Inhabitants thereof with Water; and for other Purposes:" "An Act for altering and amending certain Acts for regulating the Police of the City of Edinburgh and the adjoining Districts; and for other Purposes relating thereto:" "An Act to accelerate the raising by The Newcastle upon Tyne and Carlisle Railway Company of a certain Sum for the more speedy Prosecution of the Undertaking:" "An Act for making and maintaining a Railway from the Basin of the Exeter Canal in the Parish of Saint Thomas the Apostle, in the County of Devon, to the Four Mills in the Parish of Crediton, in the said County:" "An Act for the more effectual Drainage of the Lands within Blankney Fen, Blankney Dales, Linwood Fen, Linwood Dales, and Martin Fen and Martin Dales, in the County of Lincoln:" "An Act for the better Drainage of certain Lands in the Parishes of Spalding and Pinchbeck, in the County of Lincoln, the Waters from which are discharged by the Blue Gowt Drain:" "An Act for repealing Parts of, and amending and enlarging the Powers of other Parts of an Act for embanking and draining certain Fens and Low Lands in the Parishes of Nocton and Potterhanworth, in the County of Lincoln, and in the Parish of Branston, in the County of the City of Lincoln:" "An Act for more effectually repairing and amending the Marlborough District of the Road from Swindon to Marlborough, and from Marlborough to Everley, in the County of Wilts, and also the Branch Road from the same to the present Turnpike Road from Andover to Devizes; and for making a Road from the said Branch Road at Collingbourn Ducis to join the present Turnpike Road from Andover to Salisbury, in the said County:" "An Act for repairing and improving the Road from the Great Bridge in the Borough of Warwick, through Southam and Daventry, to the Town of Northampton:" "An Act for repairing and improving the Roads from Prestwich to Bury and Ratcliffe, in the County Palatine of Lancaster:" "An Act for amending and enlarging the Powers and renewing the Term granted by certain Acts passed for improving the Communication between the City of Glasgow and the City of Carlisle:" "An Act for amending and continuing the Acts relating to the Road from Elvan Foot, in the County of Lanark, to Beatock Bridge, in the County of Dumfries:" "An Act for better maintaining certain Roads within the County of Carmarthen called "The Three Commotts District of Roads;" and for making several Branches, Diversions and Extensions from such Roads:" "An Act for vesting in Archibald Lord Douglas of Douglas, or the Heir of Entail in Possession for the Time being, certain detached Parts of the Douglas Estates in Fee-Simple, upon entailing certain other Lands equivalent in Value thereto:" "An Act to empower the Judges of the Court of Session in Scotland to sell such Part or Parts of the Entailed Estates belonging to John Richardson Esquire, of Pitfour, in the County of Perth, as shall be sufficient for Payment of the Debts and Provisions affecting the same:" "An Act for separating the Rectory of Easington, in the County and Diocese of Durham, from the Archdeaconry of Durham, and annexing in lieu thereof a Prebend or Canonry founded in the Cathedral Church of Durham:" "An Act for vesting certain Settled Estates of Philip Pusey Esquire, in the Counties of Kent and Berks, in Trustees, for Sale, and for laying out the Money thence arising in the Purchase of other Estates, to be settled to the same Uses:" "An Act for inclosing Lands in the Parish of Thornbury, in the County of Gloucester:" "An Act for inclosing Lands within the Hamlet of Hill and Moor, in the Parish of Fladbury, in the County of Worcester." And albeit the said Acts by you Our said Subjects, the Lords and Commons in this Our present Parliament assembled, are fully agreed and consented unto, yet nevertheless the same are not of Force and Effect in the Law without Our Royal Assent given and put to the said Acts; And for as much as for divers Causes and Considerations We cannot conveniently at this Time be present in Our Royal Person in the Higher House of Our said Parliament, being the accustomed Place for giving Our Royal Assent to such Acts as have been agreed upon by you Our said Subjects, the Lords and Commons, We have therefore caused these Our Letters Patent to be made, and have signed the same, and by the same do give and put Our Royal Assent to the said Acts, and to all Articles, Clauses and Provisions therein contained, and have fully agreed and assented to the said Acts; Willing that the said Acts, and every Article, Clause, Sentence and Provision therein contained, from henceforth shall be of the same Strength, Force and Effect, as if We had been personally present in the said Higher House, and had openly and publicly, in the Presence of you all, assented to the same: And We do by these Presents declare and notify the same Our Royal Assent, as well to you the Lords Spiritual and Temporal, and Commons aforesaid, as to all others whom it may concern; Commanding also by these Presents Our well-beloved and faithful Councillor Henry Lord Brougham and Vaux, Our Chancellor of that Part of Our United Kingdom of Great Britain and Ireland called Great Britain, to seal these Our Letters Patent with Our Great Seal of Our United Kingdom of Great Britain and Ireland; and also commanding Our most dear Brothers and faithful Councillors Ernest Duke of Cumberland, Augustus Duke of Sussex, Adolphus Duke of Cambridge; Our most dear Cousin and faithful Councillor William Frederick Duke of Gloucester; The Most Reverend Father in God and Our faithful Councillor William Archbishop of Canterbury, Primate and Metropolitan of all England; Our well-beloved and faithful Councillor Henry Lord Brougham and Vaux, Chancellor of that Part of Our United Kingdom of Great Britain and Ireland called Great Britain; Our most dear Cousin and Councillor Henry Marquess of Lansdowne, President of Our Council; Our wellbeloved and faithful Councillor John George Lord Durham, Keeper of Our Privy Seal; Our most dear Cousins and Councillors William Spencer Duke of Devonshire, Chamberlain of Our Household; Charles Duke of Richmond, George William Frederick Duke of Leeds, William Henry Duke of Portland, Arthur Duke of Wellington, Richard Duke of Buckingham and Chandos, Richard Marquess Wellesley, Steward of Our Household; Charles Marquess of Winchester, John Jeffreys Marquess Camden, Henry William Marquess of Anglesey, John Earl of Westmorland, George Earl of Carlisle, Cropley Ashley Earl of Shaftesbury, George Earl of Aberdeen, William Earl Fitzwilliam, George John Earl Spencer, John Earl of Chatham, Henry Earl Bathurst, Charles Earl Grey, John Earl of Eldon, John William Earl of Dudley, William Viscount Melbourne, Robert Viscount Melville, Henry Viscount Sidmouth, Frederick John Viscount Goderich; Our well-beloved and faithful Councillors Henry Richard Lord Holland, William Wyndham Lord Grenville, Edward Lord Ellenborough, Nicholas Lord Bexley, John Singleton Lord Lyndhurst and Charles Lord Tenterden, or any Three or more of them, to declare and notify this Our Royal Assent in Our Absence in the said Higher House, in the Presence of you, the said Lords and Commons of Our Parliament, there to be assembled for that Purpose; and the Clerk of Our Parliaments to endorse the said Acts with such Terms and Words, in Our Name, as is requisite and hath been accustomed for the same, and also to enrol these Our Letters Patent, and the said Acts, in the Parliament Roll; and these Our Letters Patent shall be to every of them a sufficient Warrant in that Behalf: And finally, We do declare and will, that after this Our Royal Assent given and passed by these Presents, and declared and notified as is aforesaid, then and immediately the said Acts shall be taken, accepted and admitted good, sufficient and perfect Acts of Parliament and Laws, to all Intents, Constructions and Purposes, and to be put in due Execution accordingly, the Continuance or Dissolution of this Our Parliament, or any other Use, Custom, Thing or Things to the contrary thereof notwithstanding. In Witness whereof We have caused these Our Letters to be made Patent. "Witness Ourself at Westminster, the Twenty-third Day of June, in the Second Year of Our Reign. 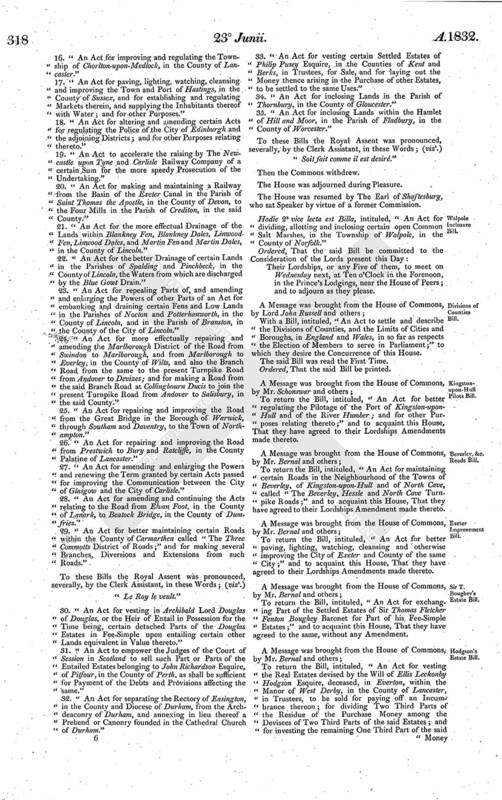 "In obedience to His Majesty's Commands, and by virtue of the Commission which has been now read, We do declare and notify to you, the Lords Spiritual and Temporal, and Commons, in Parliament assembled, That His Majesty hath given his Royal Assent to the several Acts in the Commission mentioned; and the Clerks are required to pass the same in the usual Form and Words." 1. "An Act to apply the Sum of Four Millions out of the Consolidated Fund to the Service of the Year One thousand eight hundred and thirty-two." "Le Roy remercie ses bons Sujets, accepte leur Benevolence, et ainsi le veult." 2. "An Act for consolidating and amending the Laws relating to the Payment of Army Prize Money." 3. 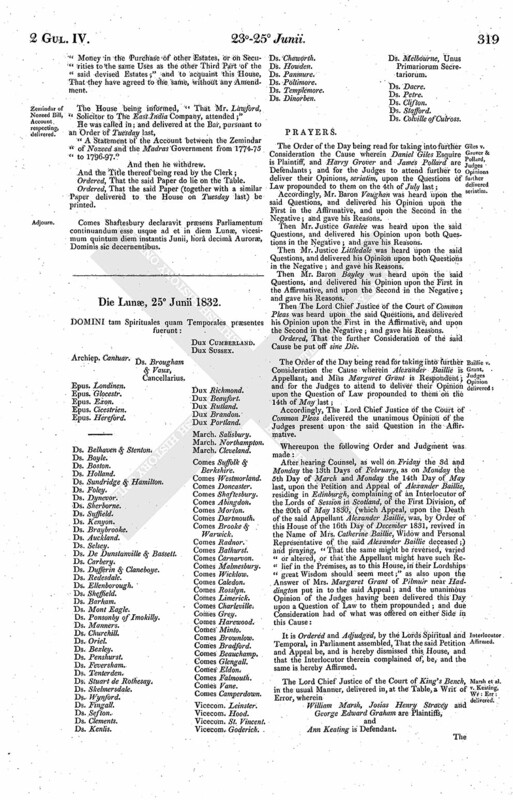 "An Act to continue and extend the Provisions of an Act passed in the Fifty-ninth Year of His Majesty King George the Third, for giving additional Facilities in Applications to Courts of Equity regarding the Management of Estates or Funds belonging to Charities; and for making certain Provisions respecting Estates or Funds belonging to Charities." 4. "An Act to suspend, until the End of the next Session of Parliament, the making of Lists and the Ballots and Enrolments for the Militia of the United Kingdom." 5. "An Act to extend the Provisions of an Act of the First Year of the Reign of His present Majesty, for altering and amending the Law regarding Commitments by Courts of Equity for Contempts, and the taking Bills pro Confesso; and to explain certain Parts thereof." 6. "An Act for making Provision for the Dispatch of the Business now done by the Court of Exchequer in Scotland." 7. "An Act to regulate the Practice and the Fees in the Vice Admiralty Courts Abroad, and to obviate Doubts as to their Jurisdiction." 8. "An Act to extend the Provisions of an Act of the Fifty-seventh Year of His Majesty King George the Third, for regulating the Offices of Clerks of the Signet and Privy Seal." 9. "An Act to enable His Majesty, His Heirs and Successors, to appoint a Trustee of the British Museum." 10. "An Act to promote the Improvement of a District of Mountain Land in the Counties of Limerick Cork and Kerry, in Ireland, by making new Roads through the same; and to encourage the Employment of the poor Inhabitants thereof." 11. "An Act to regulate the Office of Clerk of the Crown in the Court of King's Bench in Ireland." 12. 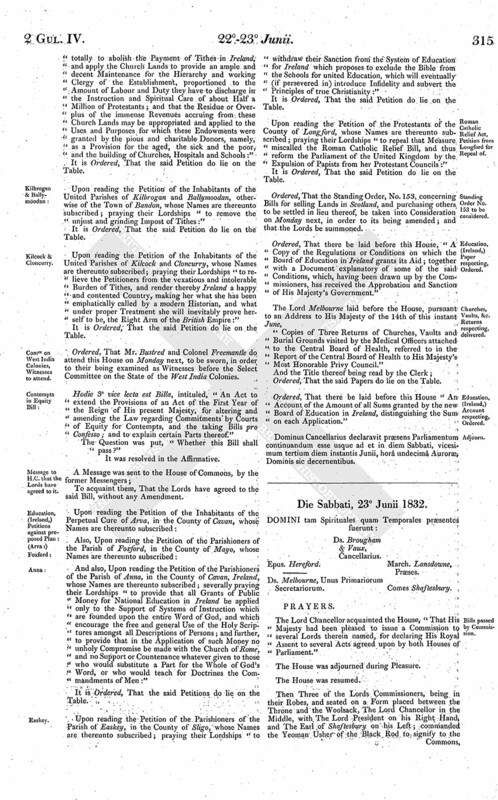 "An Act to extend the Jurisdiction of the Commissioners acting in the Execution of Three Acts for paving and regulating the Regent's Park, and several Streets and Places in Westminster, to certain other Streets and Places in Westminster; and for other Purposes." 13. "An Act for holding the Assizes for the County of Norfolk, and for the City of Norwich and County of the same City, Twice in every Year at Norwick." 14. "An Act for more easily providing Compensation for the Damage and Injury committed within the City of Bristol and County of the same City during the late Riots and Disturbances therein." 15. "An Act for repairing, lighting and watching the District of the United Parishes of Saint James and Saint Paul, in the County of Gloucester; and for the Care of the Poor thereof." 16. "An Act for improving and regulating the Township of Chorlton-upon-Medlock, in the County of Lancaster." 17. "An Act for paving, lighting, watching, cleansing and improving the Town and Port of Hastings, in the County of Sussex, and for establishing and regulating Markets therein, and supplying the Inhabitants thereof with Water; and for other Purposes." 18. "An Act for altering and amending certain Acts for regulating the Police of the City of Edinburgh and the adjoining Districts; and for other Purposes relating thereto." 19. "An Act to accelerate the raising by The Newcastle upon Tyne and Carlisle Railway Company of a certain Sum for the more speedy Prosecution of the Undertaking." 20. "An Act for making and maintaining a Railway from the Basin of the Exeter Canal in the Parish of Saint Thomas the Apostle, in the County of Devon, to the Four Mills in the Parish of Crediton, in the said County." 21. "An Act for the more effectual Drainage of the Lands within Blankney Fen, Blankney Dales, Linwood Fen, Linwood Dales, and Martin Fen and Martin Dales, in the County of Lincoln." 22. "An Act for the better Drainage of certain Lands in the Parishes of Spalding and Pinchbeck, in the County of Lincoln, the Waters from which are discharged by the Blue Gowt Drain." 23. 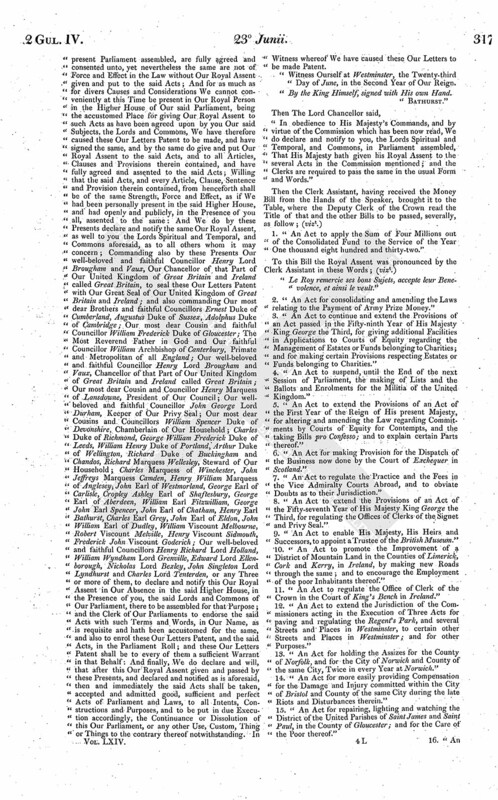 "An Act for repealing Parts of, and amending and enlarging the Powers of other Parts of an Act for embanking and draining certain Fens and Low Lands in the Parishes of Nocton and Potterhanworth, in the County of Lincoln, and in the Parish of Branston, in the County of the City of Lincoln." 24. 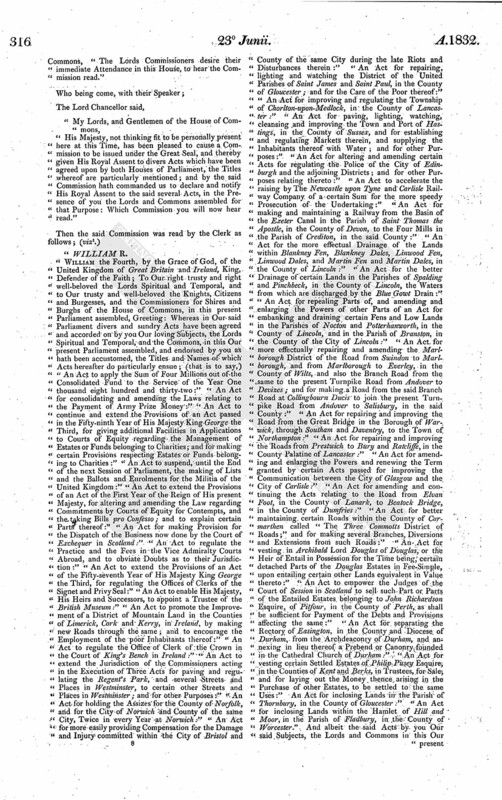 "An Act for more effectually repairing and amending the Marlborough District of the Road from Swindon to Marlborough, and from Marlborough to Everley, in the County of Wilts, and also the Branch Road from the same to the present Turnpike Road from Andover to Devizes; and for making a Road from the said Branch Road at Collingbourn Ducis to join the present Turnpike Road from Andover to Salisbury, in the said County." 25. "An Act for repairing and improving the Road from the Great Bridge in the Borough of Warwick, through Southam and Daventry, to the Town of Northampton." 26. "An Act for repairing and improving the Road from Prestwich to Bury and Ratcliffe, in the County Palatine of Lancaster." 27. "An Act for amending and enlarging the Powers and renewing the Term granted by certain Acts passed for improving the Communication between the City of Glasgow and the City of Carlisle." 28. "An Act for amending and continuing the Acts relating to the Road from Elvan Foot, in the County of Lanark, to Beatock Bridge, in the County of Dumfries." 29. "An Act for better maintaining certain Roads within the County of Carmarthen called "The Three Commotts District of Roads;" and for making several Branches, Diversions and Extensions from such Roads." 30. "An Act for vesting in Archibald Lord Douglas of Douglas, or the Heir of Entail in Possession for the Time being, certain detached Parts of the Douglas Estates in Fee-Simple upon entailing certain other Lands equivalent in Value thereto." 31. "An Act to empower the Judges of the Court of Session in Scotland to sell such Part or Parts of the Entailed Estates belonging to John Richardson Esquire, of Pitfour, in the County of Perth, as shall be sufficient for Payment of the Debts and Provisions affecting the same." 32. "An Act for separating the Rectory of Easington, in the County and Diocese of Durham, from the Archdeaconry of Durham, and annexing in lieu thereof a Prebend or Canonry founded in the Cathedral Church of Durham." 33. "An Act for vesting certain Settled Estates of Philip Pusey Esquire, in the Counties of Kent and Berks, in Trustees, for Sale, and for laying out the Money thence arising in the Purchase of other Estates, to be settled to the same Uses." 34. "An Act for inclosing Lands in the Parish of Thornbury, in the County of Gloucester." 35. "An Act for inclosing Lands within the Hamlet of Hill and Moor, in the Parish of Fladbury, in the County of Worcester." Hodie 2a vice lecta est Billa, intituled, "An Act for dividing, allotting and inclosing certain open Common Salt Marshes, in the Township of Walpole, in the County of Norfolk." Their Lordships, or any Five of them, to meet on Wednesday next, at Ten o'Clock in the Forenoon, in the Prince's Lodgings, near the House of Peers; and to adjourn as they please. With a Bill, intituled, "An Act to settle and describe the Divisions of Counties, and the Limits of Cities and Boroughs, in England and Wales, in so far as respects the Election of Members to serve in Parliament;" to which they desire the Concurrence of this House. To return the Bill, intituled, "An Act for better regulating the Pilotage of the Port of Kingston-uponHull and of the River Humber; and for other Purposes relating thereto;" and to acquaint this House, That they have agreed to their Lordships Amendments made thereto. To return the Bill, intituled, "An Act for maintaining certain Roads in the Neighbourhood of the Towns of Beverley, of Kingston-upon-Hull and of North Cave, called "The Beverley, Hessle and North Cave Turnpike Roads;" and to acquaint this House, That they have agreed to their Lordships Amendment made thereto. To return the Bill, intituled, "An Act for better paving, lighting, watching, cleansing and otherwise improving the City of Exeter and County of the same City;" and to acquaint this House, That they have agreed to their Lordships Amendments made thereto. To return the Bill, intituled, "An Act for exchanging Part of the Settled Estates of Sir Thomas Fletcher Fenton Boughey Baronet for Part of his Fee-Simple Estates;" and to acquaint this House, That they have agreed to the same, without any Amendment. To return the Bill, intituled, "An Act for vesting the Real Estates devised by the Will of Ellis Leckonby Hodgson Esquire, deceased, in Everton, within the Manor of West Derby, in the County of Lancaster, in Trustees, to be sold for paying off an Incumbrance thereon; for dividing Two Third Parts of the Residue of the Purchase Money among the Devisees of Two Third Parts of the said Estates; and for investing the remaining One Third Part of the said Money in the Purchase of other Estates, or on Securities to the same Uses as the other Third Part of the said devised Estates;" and to acquaint this House, That they have agreed to the same, without any Amendment. The House being informed, "That Mr. Lawford, Solicitor to The East India Company, attended;"
"A Statement of the Account between the Zemindar of Nozeed and the Madras Government from 1774-75 to 1796-97." Ordered, That the said Paper do lie on the Table. Ordered, That the said Paper (together with a similar Paper delivered to the House on Tuesday last) be printed. Comes Shaftesbury declaravit præsens Parliamentum continuandum esse usque ad et in diem Lunæ, vicesimum quintum diem instantis Junii, horâ decimâ Auroræ, Dominis sic decernentibus.